Carol Storie's popular Canvas Candy Bowl canvas work course will be ending on September 30, 2018. Be sure to sign up for this course before it's too late! This adorable canvas candy bowl with its abstract design is lots of fun to stitch. 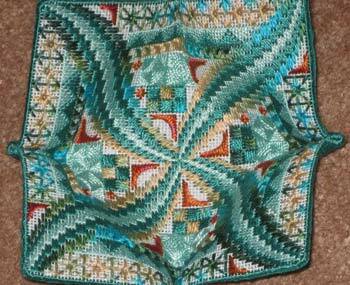 Bargello is combined with a variety of textured stitches worked on 18 count mono canvas. When all the stitching is complete, it is backed with fabric and made into a bowl to hold candies, jewellery or whatnot! Carol designed this course for all skill levels. She is a offering a kit option. Get all of the course details on the EAC website.